In an age of managed care, how does the clinician best help couples in marital distress? Do the short-term protocols developed and tested in the laboratory really work in the average clinical setting? This project examined the feasibility and effectiveness of implementing a laboratory-based program designed to prevent the development of relationship distress within a health maintenance organization. Both men and women reported high satisfaction with the program and a subjective sense that it was helpful for their relationships. Specific suggestions are made for assisting therapists in using effective treatments for couples in managed care settings. Copyright © 2000 American Psychological Association. This article may not exactly replicate the final version published in the APA journal. It is not the copy of record. Sullivan, K.T., & Goldschmidt, D. (2000). Implementation of empirically validated interventions in managed care settings: The premarital relationship enhancement program (PREP). 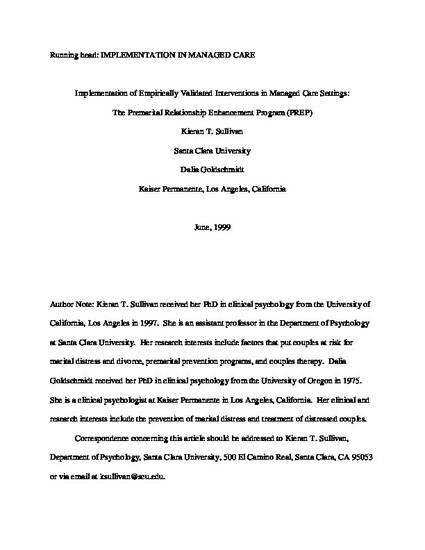 Professional Psychology: Research and Practice, 31, pp. 216-220.